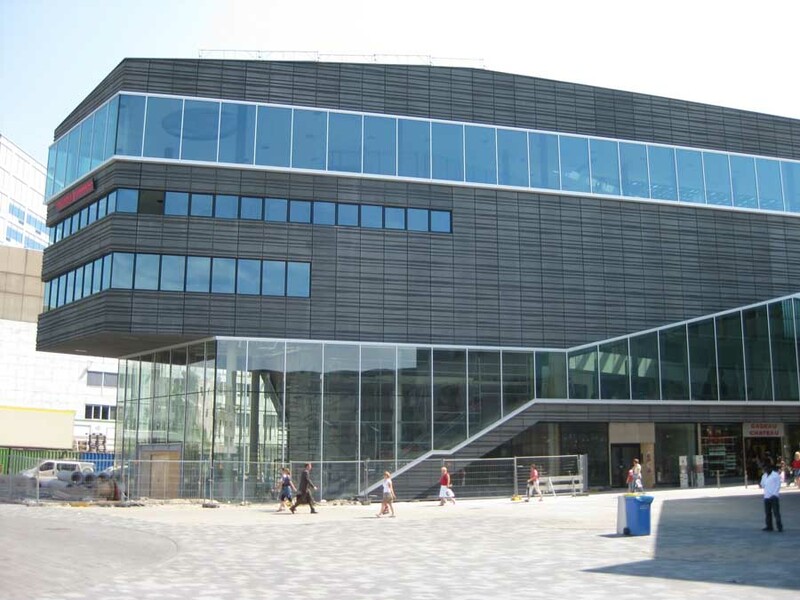 This project by Drost + van Veen Architecten is nominated for an architecture award called Architectuurprijs Almere 2010. The Oostvaarders was selected out of more then 80 projects. Nature-education-centre “The Oostvaarders” is situated in a unique nature reserve in Europe: The Oostvaardersplassen in Almere, The Netherlands. The building is constructed at a junction of various landscapes with the different characters of land, water, forest and reed fields. To serve a wide audience there is an information room, classroom, panorama-room, restaurant and representative meeting-room: the new icon of Almere. The Oostvaarders presents itself in two different shapes. From the parking the shape is inviting, like a vertical beacon rising from the plain. On the contrary the shape from the lakeside is horizontal, connecting the building with the extensive dyke and water. On the first floor the panorama-room, with a large horizontal window, gives a stunning view over the lake. The entrance of the building is situated at the foot of the dyke. From the entrance the visitor climbs the stairs to the crow’s nest: an exterior space to view the environment. This movement is emphasized by a continuous sightline through the building that connects the entrance and the crow’s nest. In order to minimize a disruption in the surrounding natural environment, the building time was reduced to a minimum. Therefore, the building is constructed in prefab, massive, wooden walls and floors. The LenoTec walls are fabricated in Finland. The use of these prefabricated elements made it possible to create an eight-meter overhang over the lake. In addition, wood is a light material with a high isolation. The natural expression of this material is maintained in the interior, as reference to a wooden cottage. The facades are constructed of prefab, timber pinewood elements. These elements are arranged in different patterns and textures. The perforations in the facade vary in direction and size. Various framed views, through the façade, allow the visitor to learn and observe the environment in different ways.